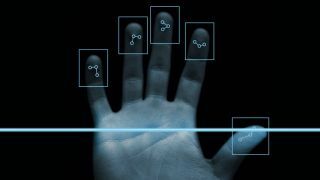 While the iPhone rumor mill is one of the most confusing things in the world to pick through, the idea that the iPhone 5S will come with a biometric fingerprint scanner is one that won't go away. Apple has spent a fortune buying AuthenTec, a company that specialises in this technology, has multiple patents in the biometric space for the mobile phone and tablet - and, crucially, needs to have something to crow about when it launches the iPhone 5 again and pretends it's an all-new beast. This sparked a bit of a debate in the TechRadar office. A couple of members of the team couldn't see the point of having such a piece of technology on a phone. "Sounds like another gimmick that we don't need," she said. No, no and no. If Apple does bring out an iPhone 5S complete with a fingerprint scanner on the home button, then it won't be another 'Smart Pause' moment (seriously, Samsung, what were you thinking?) No, this will be a moment that heralds a shift in the way we use phones forever. Think about it: adding biometric sensors to a phone makes perfect sense. Unlike tablets, phones do not need guest modes because they will almost never be used by anyone but their owner. A phone has your digital life stored on it, so a way to lock it only to you makes a huge amount of sense. We've already seen efforts to do this from the Google camp. Face Unlock is a standard feature of Android now and the new Moto X has a dedicated chip to listen out for your voice. Combine those with a fingerprint scanner and you'd have a robust system that makes the notion of using a passcode or pattern laughable. There's another benefit to a fingerprint scanner: speed. It would be as quick, if not quicker, to enter a fingerprint than to enter a few numbers, plus the finger wouldn't have to move so far - a bonus as phone displays grow ever larger. People who don't secure their phone do so simply because they can't be bothered with the extra step to unlock it time and again - they still care about their data. Another criticism leveled at today's fingerprint scanners is that the ones on PCs and laptops get about as much use Bermuda shorts in wintertime. True - but you don't open and close a traditional computer tens or hundreds of times a day. Speaking of the laptop, Apple could be approaching the fingerprint scanner from another angle: business. The smartphone is increasingly replacing the business laptop in the office for certain tasks and especially on the go. As such, it is often filled with all kinds of sensitive information. BlackBerry and Samsung are both making a big deal about security on their phones and tablets, but imagine if there was no way the phone could be used by anyone else out there? You can watch someone enter a passcode but you can't very easily fake a fingerprint, making the life of a thief, even a diligent one, much harder than before. I'm not saying that an iPhone with a scanner will change everything instantly. If that was the case, then someone else (let's face it, Samsung or LG) would have done it already. But the foundations are there. The need is there too, as other manufacturers also seem to be following suit. There have been a number of high profile patents filed by Apple's competitors in this area, and there are rumors that HTC is going to be first out the blocks to do the same thing with the new One Max. I'm all for security, and if it can make my life easier (and, let's face it, cooler) then I'm all for it. Just remember that it doesn't mean a phone is dull when Apple goes on and on about how the iPhone 5S is 'The Most Securest iPhone ever'. Not bothered about security? Want to pay less for a new iPhone? We've got the ultimate lowdown on the new 'budget' iPhone 5C right here.